Looking "where to sell my Austin Healey 100?" Ask the Chicago Car Club! Are you wondering "where to sell my Austin Healey 100 ?" The Chicago Car Club is interested in classic cars of all makes and models, especially a Austin Healey 100. We make the process of selling your Austin Healey 100 quick and painless. In just a matter of hours we will have your classic valued and, if you do so choose, turned into money in your pocket. All it takes is a phone call or electronic inquiry to get the ball rolling. The Austin-Healey 100 is a British car that was built from 1953-1956. Developed by Donald Healey to be produced in-house by Healeys small company in Warwick, England and based on the Austin A90 Atlantic. It was introduced at the 1952 London Auto Show, where it caught the eye of the head of the Austin car company. A deal was struck to build the cars at the Austin Longbridge factory with bodies by Jensen. 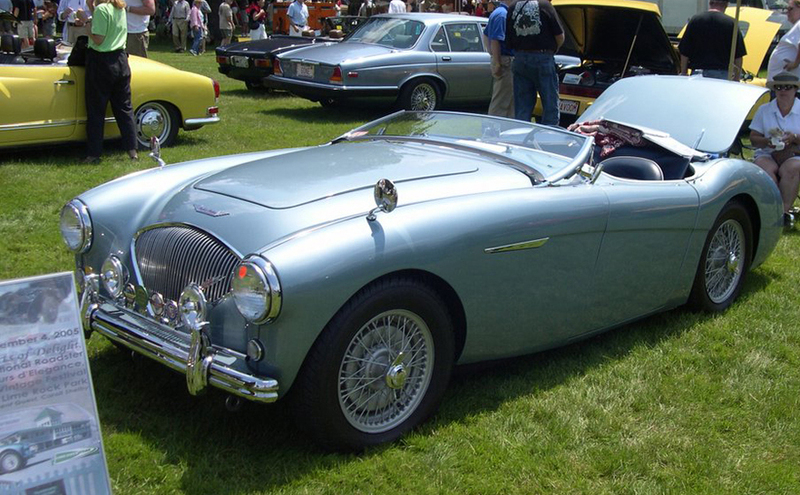 The resulting car was called the Austin-Healey 100 and was the first of the long-lived Austin-Healey partnership. The “100” in the name was to represent the top speed of the car. Tested by Motor magazine in 1953 at 106 mph top speed and an elapsed time of 11.2 seconds to 60 mph. The next edition, the BN2 had greater horsepower due to mechanical upgrades. 4604 BN2s produced. A kit was also available for owners of the BN1 and BN2 models, called the Le Mans Engine Modification Kit. It boosted the power to 100 hp. These Austin-Healey cars were inexpensive for the amount of power and the attractive styling. They are a good entry-level car for collectors. A 100 series Austin-Healey in fair condition for as little as $25,000. Good examples can fetch much more. One car that was driven by driver David Shale in races recently sold for £673,500 at the Bonhams Goodwood Festival of Speed auction on 27 June 2014.